Celebrated German-American pianist and composer. 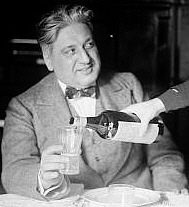 Accompanied Lanza on two test recordings (“Vesti la Giubba” from Pagliacci and “Che Gelida Manina” from La Bohème) for MGM film studios on September 8, 1947. Previn also worked with his uncle Charles Previn (see below) on adapting portions of Tchaikovsky's Fifth Symphony and Piano Concerto No. 1 for Lanza and co-star Kathryn Grayson to sing (as part of a fictional opera) in the 1949 MGM film That Midnight Kiss. German bandleader who conducted Lanza in his only German-language recording: the brief Hofbrauhaus Song (“Wer einmal nur in München war”), which was included in the tenor's final film, For the First Time. 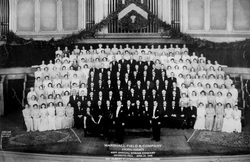 Reiter conducted the Bel Canto Trio (comprising Lanza, soprano Frances Yeend and bass-baritone George London) at a well-received concert with the San Antonio Symphony Orchestra at the Majestic Theatre, San Antonio, Texas, on November 8, 1947. Last-minute replacements for the indisposed soprano Helen Traubel, the Trio received high praise from music reviewer Ernest Pratt of the San Antonio Light, who singled out their performance of "Qual Voluttà Trascorrere" from Verdi's I Lombardi (while also praising Reiter and his orchestra for coping admirably with this and other largely unfamiliar scenes despite only one rehearsal). More about Reiter's interesting life can be read here. American-born conductor and record producer who spent much of his early life in Germany, where he studied at the Royal Berlin Academy of Music and later worked with several orchestras. Returning to the USA in 1936, he went on to form his own orchestra, and later worked for RCA Victor as a conductor and arranger. 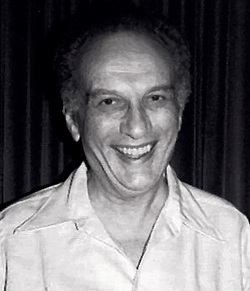 René produced Lanza's first concept album, the disastrous Lanza in Broadway of May 1956, and then went on to conduct (successfully) the tenor's next album, Cavalcade of Show Tunes, three months later, in addition to conducting a number of singles and Christmas carols recorded by Lanza between August 1956 and April 1957. American vocal coach who taught from a studio in New York City's Carnegie Hall building. 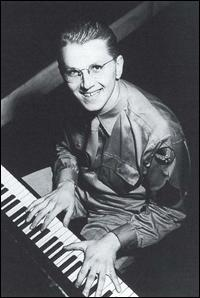 On the suggestion of his friend and mentor baritone Robert Weede, Lanza studied song repertoire with Ms. Robinson in 1945. Legendary Italian voice teacher whose pupils included such celebrated tenors as Beniamino Gigli (1890-1957) and Giacomo Lauri-Volpi (1892-1979). 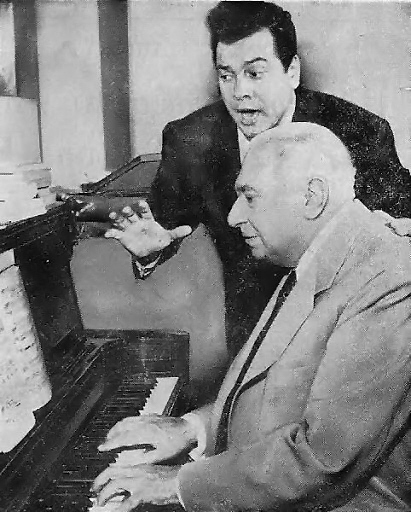 Lanza studied intensively with Rosati for fifteen months from 1946 to 1947, and later credited his teacher with endowing him with a solid vocal technique that enabled him to “sing for hours without becoming tired.” Lanza's close friend bass-baritone George London later observed that prior to his studies with Rosati, the tenor's voice was an extremely beautiful but “unschooled” instrument. According to London, “Rosati directed [Lanza] to sing more lyrically, with less pressure, to good advantage.” The improvements in Lanza's singing, both in terms of vocal production and style, as a result of his time with Rosati can clearly be heard by comparing the tenor's (pre-Rosati) performances on the “Great Moments in Music” radio broadcasts of 1945-46 with his August 1947 Hollywood Bowl concert. 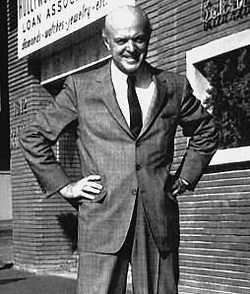 Hungarian-born composer and conductor, active in the US from 1940 to 1995, who wrote nearly one hundred film scores in addition to numerous chamber and symphonic works. 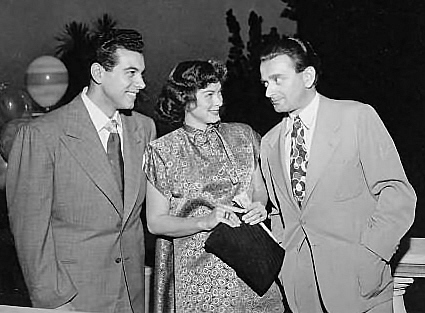 Rózsa conducted Lanza's second appearance at the Hollywood Bowl (with soprano Kathryn Grayson) on July 24, 1948, and also wrote (for the MGM film Quo Vadis?) the music for the song “Lygia,” which Lanza recorded in 1951. Among the selections that Lanza performed (magnificently) under Rózsa's direction in 1948 were Bizet's "Agnus Dei," which can be heard here, and Puccini's "Nessun Dorma." American pianist, arranger, film composer and conductor, associated with the NBC West Coast Orchestra. Russell conducted Lanza and Kathryn Grayson on the live radio broadcast "Screen Guild Theater Program" (NBC) on 29 September 1949. Lanza performed "I Know, I Know, I Know," "Mamma Mia, Che Vo' Sape?" and (with Grayson) "They Didn't Believe Me" and "Verrano a Te sull'Aure" from Lucia di Lammermoor. 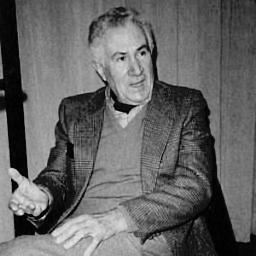 Italian composer, conductor and arranger, principally associated with films, including The Godfather (1972), for which he served as Music Director. Savina conducted Lanza on three songs (“Come Prima,” “O Mon Amour,” and “O Sole Mio”) in 1958 for the soundtrack of For the First Time, in addition to arranging five of the songs on the Mario! album (“Dicitencello Vuie,” “Maria Mari',” “Fenesta che Lucive,” “Tu Ca Nun Chiagne,” “'Na Sera 'e Maggio”). Canadian conductor, notably with the CBC Symphony Orchestra (1952-57). 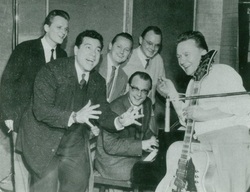 Scherman worked internationally as a violinist in his later years, serving for two years with the Royal Philharmonic Orchestra (1958-60) and on many studio recordings (including the Beatles' “Within You, Without You” on their celebrated "Sergeant Pepper" album). Scherman conducted Lanza at a concert with the Toronto Symphony Orchestra at Toronto's Massey Hall on March 5, 1948. Among the selections Lanza sang that evening were “La Donna è Mobile” from Verdi's Rigoletto, “È la Solita Storia” from Cilea's L'Arlesiana, and “Vesti la Giubba” from Leoncavallo's Pagliacci. (These performances have survived, and Lanza's lyrical rendition of “È la Solita Storia” can be heard here.) The Toronto Daily Star reported on the concert the next day, noting that, "[Lanza] was called back for curtain call after curtain call, and toward the conclusion of the concert had to give two encores, so insistent was the applause." Hungarian-born French conductor who worked internationally, serving as first conductor of the Deutsche Oper Berlin, assistant conductor at the Metropolitan Opera, and as Musical Director of the Moscow Radio and Philharmonic Orchestra. Sébastian was also active in France, where he conducted Maria Callas and Renata Tebaldi at the Palais Garnier in Paris in 1958 and 1959, respectively. 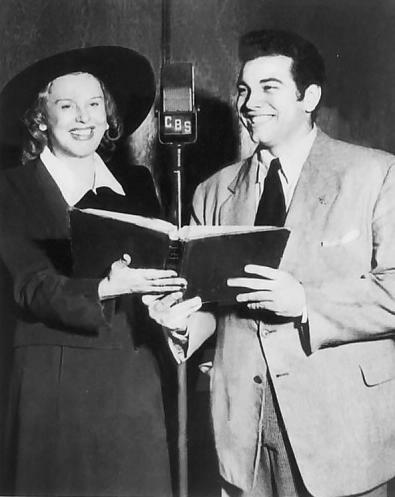 Sébastian conducted Lanza on three live radio broadcasts between October and December 1945 on the series Great Moments in Music, performing selections from Puccini's Tosca (with soprano Jean Tennyson), Verdi's Otello (with Jean Tennyson and baritone Robert Weede), and Lehmann's In a Persian Garden (with soprano Frances Yeend). 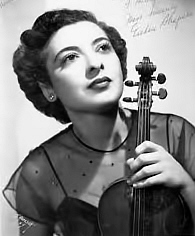 American violinist who performed as soloist under conductors such as Eugene Goossens, Fritz Reiner and William Steinberg. 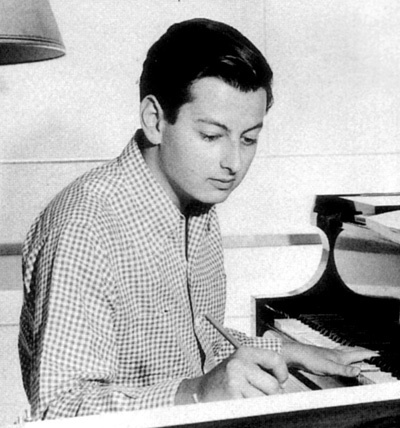 Shapiro recorded the violin solo that precedes Lanza's singing on his 1950 RCA recording of the Bach-Gounod “Ave Maria.” Due to time constraints, however, RCA elected to release the recording without the violin solo, and it was not until 1987 that Shapiro's contribution was finally heard (on the BMG CD Christmas with Mario Lanza). Note: Shapiro was a member of the orchestra on many of Lanza's RCA recordings from 1950 to 1956, and also played violin in Ray Heindorf's orchestra at Warner Bros. for the soundtrack of the tenor's fifth movie, Serenade, in 1955. Hungarian-born (his birth name was Murray Toluchko) vocal coach, operatic conductor, film soundtrack composer and one-time singer. 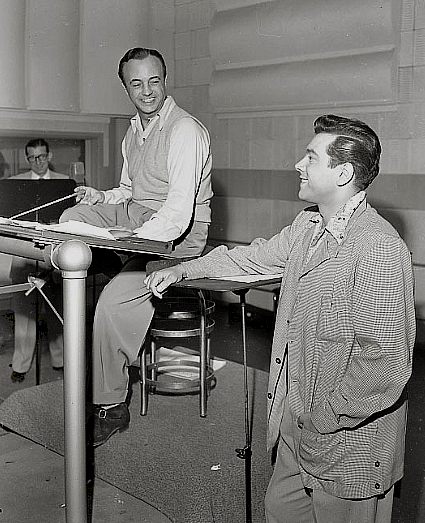 Silva, an uncle to famed economist Allan Greenspan, was Musical Director at Columbia Films when he met the 23-year-old Lanza in 1944. Italian baritone who enjoyed a long international career, singing at the Metropolitan Opera House, Covent Garden, and La Scala, among other theatres. 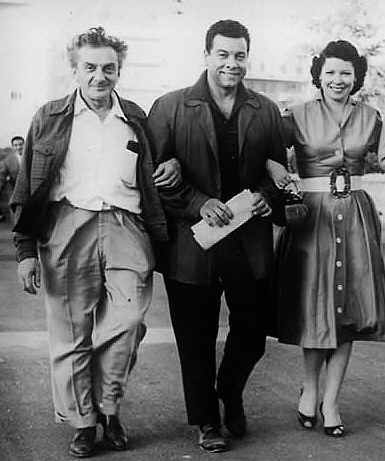 In September 1958, Silveri recorded the baritone part in the trio "E voi ridete" from Mozart's "Così fan tutte" with Lanza and bass Plinio Clabassi at the Rome Opera House for the movie "For the First Time." Silveri did not appear in the film, however---another singer lip-synched to his part. Italian-born American conductor, bandleader and arranger (and second cousin to the more famous Frank). Sinatra conducted Lanza's first million-selling single (“Be My Love”) and a number of the tenor's non-operatic recordings for RCA from 1949 to 1950. Revered Italian vocal coach, long associated with the Chicago Opera, who also worked as chorus master at the Metropolitan Opera for ten years. Among the singers Spadoni coached while serving as répétiteur with the Chicago Opera was legendary tenor Enrico Caruso (1873-1921). Spadoni coached Lanza primarily on operatic repertoire off and on from 1948 to 1957, playing a significant role in the tenor's stylistic development, as can be heard on recordings such as the demanding Act III Monologue from Verdi's Otello, on which the two men worked closely. 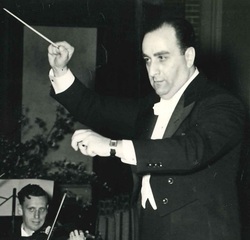 He also accompanied Lanza in a number of public performances: in September 1949 (in connection with the promotion of the tenor's first film), and at the Shrine Auditorium in April 1950 ("Friar's Frolic Charity Show"), as well as conducting the tenor's performances of “Some Day” and “E Lucevan le Stelle” on the live CBS television show Shower of Stars on October 28, 1954. [Video here.] “God has put into this boy everything that is required of a great singer,” Spadoni said of Lanza in 1949: “Intelligence, voice, memory, personality.” Note: Spadoni is the (unseen) pianist on Lanza's 1948 soundtrack recording of "Mamma Mia, Che Vo' Sape?" in That Midnight Kiss. Director of the Marshall Field Choral Society of Chicago, Stewart conducted Lanza in the Society's well-received 43rd Annual Spring Concert at Orchestra Hall in April 1949. American musical director, composer, conductor, and jazz violinist, long associated with MGM musicals. 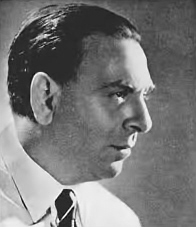 Stoll conducted some of the non-operatic numbers for the soundtracks of Lanza's films The Toast of New Orleans (1950) and For the First Time (1959), and all of the musical selections in Seven Hills of Rome (1958). The affable Stoll also wrote what are arguably the worst songs that Lanza recorded: the Calypso-flavored “There's Gonna Be a Party Tonight” (for Seven Hills of Rome) and the rock and roll pastiche “Pineapple Pickers” (featured in For the First Time). Later known as Helen Boatwright, Strassburger was an American soprano who specialized in the music of Charles Ives and other American classical composers of song. American soprano with a voice that can charitably be described as an acquired taste who performed in Italy and also with the Chicago Civic Opera and the San Francisco Opera. 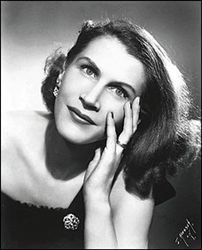 Between 1942 and 1946 Tennyson appeared regularly on the CBS radio program “Great Moments in Music,” which was sponsored by the Celanese Corporation of America, a company founded by her first husband, Camille Dreyfuss. 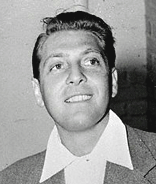 It was in 1945 that Tennyson (on the recommendation of baritone Robert Weede) approved Lanza as a temporary replacement for tenor Jan Peerce on the CBS show, and in October and November of that year, respectively, the two singers performed the Act I duet from Verdi's Otello and an abridged version of the Act I duet from Puccini's Tosca. Both recordings have survived.